The Kuhns pose at their house in Galim, May 14. CAMEROON – Rev. Mike and Kara Kuhn, along with their two sons, Tobias (3) and Gideon (1), arrived in Cameroon, West Africa, before Easter of this year to serve as missionaries with Lutheran Bible Translators of Canada (LBTC). They have been assigned to assist the Nizaa people in translating the New Testament into their mother tongue. 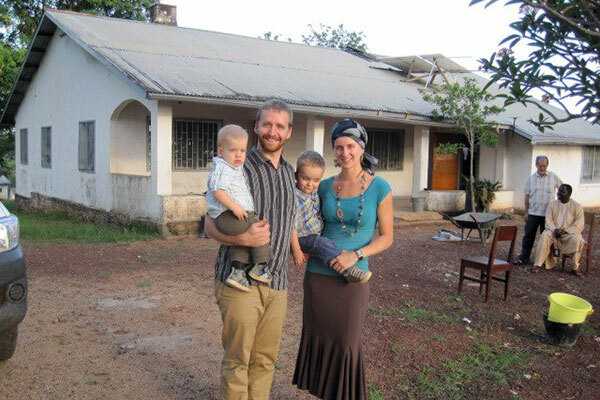 The Kuhns’ arrival in Cameroon represents the completion of a long season of preparation for the family. They were accepted as missionary candidates with LBTC in November of 2010 and had been working to get to the field since that date. Rev. Kuhn transitioned out of his call as Associate Pastor at Foothills Lutheran Church in Calgary in May of 2011. At that time, they moved to B.C.’s lower mainland so that Rev. Kuhn could pursue a Master of Arts in Linguistics at the Canada Institute of Linguistics in Langley, BC. 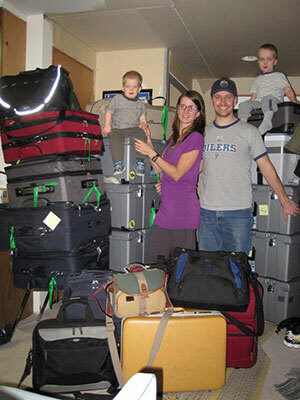 On the way: The Kuhns pose with their 14 checked bags and six carry-ons before departing for Cameroon. They put their studies on hold in August of 2012 so that they could spend six months focusing on establishing partnerships that will sustain them in their work. This preparatory work saw them move four times and go on seven, long road trips while they crisscrossed Western Canada. After two and a half years of getting ready for their work in Cameroon, the Kuhn family was excited to finally move to their field of service on March 25, 2013. However, the Kuhns weren’t able to fully unpack their bags for another seven weeks after arriving in Africa. They stayed in the nation’s capital, Yaoundé, for three weeks so that they could meet colleagues, purchase supplies, and get a truck. Then, they were based out of a large city (Ngaoundéré) near their village for another four weeks while they made short trips out to the future home as they worked to get it ready to move in. Long-time LBTC missionaries Martin and Joan Weber offered invaluable counsel and service to the Kuhn family as they acclimatized to life in Cameroon and worked to get their house into a state that would permit them to move to their village (Galim). The Kuhns were finally able to move to Galim on May 14. Rev. 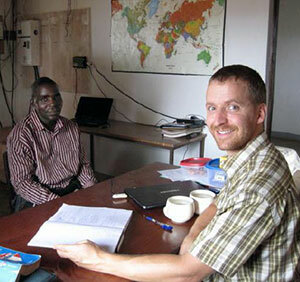 Mike Kuhn at work with his language resource person, a Muslim Nizaa named Yougouda Bah. Since that time, their days have been replete with new sounds, new faces, new flavours, and new challenges. The greatest challenge facing them in their work is that most Nizaa speakers are Muslims and feel a great deal of pressure to remain Muslims. Already during their time among the Nizaa, the Kuhn family has heard stories about people who have believed the Gospel or shown great interest in hearing more about Jesus, but have been teased and mocked by their neighbours until they conform again to the predominantly Muslim ways of their people. Those who have persevered in the faith live apart from their kin among Christians from other tribes, so the Gospel has never really taken root among the Nizaa up to this point. LBTC invites readers to join the Kuhn’s in rejoicing that God has opened the way for them to serve, work, and witness among the Nizaa people. Please also pray that God will cause His Word of Gospel to go out among this people group with power so that many will believe in Jesus Christ as they hear about Him in their mother tongue. Nice, a Blog content is beautiful Cameroon.